People with disabilities face many barriers to economic success -- low expectations, discrimination and a complex public support system that often limit employment opportunities and upward mobility. Poverty and disability are intricately related. It is troubling to note that 25 years after the passage of the Americans with Disabilities Act (ADA), adults with disabilities are twice as likely to live in poverty as those without a disability. This broad statistic, though compelling, masks important differences in the poverty rate among demographic groups who face additional economic challenges -- women, members of minority groups, people with lower levels of education and assorted age groups. The disparity in the poverty rate between people with and without disabilities grows with age: among those 18-30 years old, the poverty rate is 21 percent for those without disabilities and 32 percent for those with disabilities; among those 30-45 years of age, 12 percent without disabilities live in poverty, as compared to 33 percent with disabilities. Among those 45-64 years old, nine percent without disabilities live in poverty, compared to 26 percent with disabilities. When it comes to gender, women with disabilities are overwhelmingly more likely to live in poverty. This gender disparity, coupled with the disability disparity, results in a poverty rate of 31 percent for women, compared to 26 percent for men. People of color, both with and without disabilities, are more likely to be living in poverty than the Non-Hispanic White population. This racial disparity, when coupled with disability, results in nearly 40 percent of African Americans with disabilities living in poverty. The largest disparity in poverty between those with and without disabilities is among Non-Hispanic Whites, at 25 and 10 percent, respectively. Finally, the poverty rate is highly correlated with educational attainment for people with and without disabilities. That is, the poverty rate declines as educational level increases. 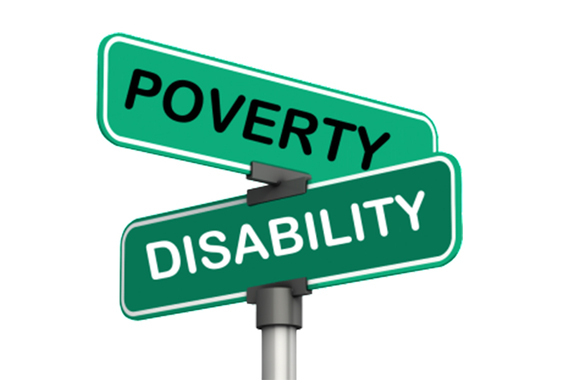 However, the economic disparity between those with and without disabilities grows as education levels increase. For example, 58 percent of African American women, 36 percent of Latino men, 34 percent of young (18-30) Non-Hispanic white women and 36 percent of older (46-65) African American men, with less than a high school education, live in poverty. Millions of American adults with disabilities are caught in this endless poverty cycle. The more we analyze the numbers, the more we begin to understand that the most economically vulnerable population in our nation is nonwhite, female, lacks a high school education, is unemployed or underemployed and cuts across the spectrum of disability. National Disability Institute is working tirelessly to build a better economic future for people with disabilities and their families. There is no single answer or simple solution. The safety net of public benefits of Social Security, Medicaid, housing and food assistance should not deny people the right to save and build assets. People with disabilities can and want to work, save and be a part of the economic mainstream. Equal opportunity to a quality education, development of critical skills for jobs that present career pathways, and opening of ABLE tax-advantaged savings accounts with no loss of public benefits all create a roadmap to financial freedom and independence.